Editor’s note: Dr. Tom Frieden is the director of the Centers for Disease Control and Prevention. The views expressed are his own. Today marks the Lunar New Year – and the world’s largest annual migration. There will be more than 3.6 billion transit trips within China, in addition to countless international trips. 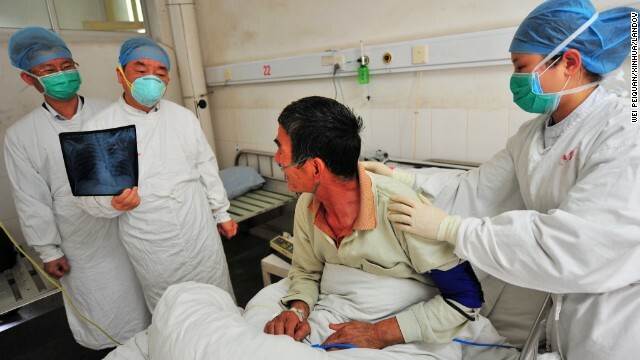 Yet this celebration comes at a time of growing concern about the H7N9 avian influenza virus. And this concern is not unfounded – should this virus change into a form that easily spreads between people, the world’s next pandemic could occur in the next three weeks. This combination of mass travel and an emerging virus such as this should underscore the connectedness of health security between countries. Of course, H7N9 influenza is just one example of how the health security of all nations, including the United States, depends on the health security of each individual nation. And regardless of where outbreaks occur, stopping them at the source is the most effective and cheapest way to save lives at home and abroad. Take the case of Isaac Baniyo, who lives in a small village in Uganda. A little over a year ago, his soaring fever and chest pains saw him sent to his community clinic where CDC-trained local healers tested him for plague. He was diagnosed within minutes with a dipstick lab test, and successfully treated for plague with a 10-day course of antibiotics. Isaac’s is the face of global health security today, a real-life example of the worry and the hope we face. Plague, like smallpox and Ebola, is a Category A bioterrorism agent that spreads easily and kills more than a third of the people it infects. So imagine a world where we didn’t have trained eyes in villages like the one Isaac lives in. One case of plague could turn into hundreds or thousands, and an isolated local case could quickly become a global disaster. That’s why it’s critical the United States and CDC are there – in countries on six continents – helping train people who are on the ground to keep their countries and the world safe from infectious disease threats. Keeping the world safe from potential public health threats of international concern is so important that all 194 Member States of the World Health Assembly committed to compliance with the revised International Health Regulations. The goal is to help the international community prevent, detect, and respond to serious public health risks that have the potential to cross borders and threaten people worldwide. CDC has committed to assist countries throughout the world with strengthening their national capacity and ability to achieve the goal of the IHR. Today we report on two projects – one in Uganda and one in Vietnam – to improve public health emergency detection and response capacity. Each project has demonstrated the possibilities and potential benefits of creating an emergency operations center, a national laboratory system, and a real-time information system. The time I spent in Uganda last year reviewing the progress of this project was deeply impressive, and will always stay with me as one of the highest impact projects CDC has undertaken in my time as director. Both Uganda and Vietnam have faced unique health challenges, including multiple Ebola and Marburg hemorrhagic outbreaks, yellow fever in Uganda, and SARS and H5N1 outbreaks in Vietnam. Our successful efforts to enhance disease detection and response in these countries show that such models can work on a global scale. This is especially relevant given continued challenges such as Middle East respiratory syndrome coronavirus (MERS-CoV) and H7N9 influenza. Prevent avoidable catastrophes and epidemics. We can only do this if we have strong systems, policies, and procedures in place in each country. Detect threats early. This requires real-time disease tracking and effective diagnostics, as well as the ability to identify and collect outbreak specimens and safely and securely transport them to accredited laboratories. Respond rapidly and effectively. We do this best when we have interconnected emergency operations centers and response capacity ready to spring into action. It is increasingly clear that the health of other nations has a direct impact on the health of us here in the United States – infectious diseases do not recognize borders. Improving global health security therefore saves American lives while boosting our international partnerships and increasing stability overseas. And when we invest the time and resources to help other countries protect their own people, we are ultimately helping protect Americans, too. What about the pandemic of yeast and parasites. Talk about that. Hope the people don't get sick. Great job CDC. Healthy people, healthy lives, happy world. And you live in Disneyland correct ?? Get health insurance. It covers flu shots. There is no flu shot for H7N9. you don't need insurance for free flu shots just look around some places give free flu shots. Not 100% sure but I the CVS and Walgreens give free flu shots and CareNow might give them for free as well. BOTH H7N9 and H5N1 are avian viruses ("bird flu")? A few years ago we all sat quaking in our boots over the H5N1's mortality rate and how it could infect billions (with a "B") of people almost overnight; are we at that door again? H5N1 has not mutated yet to easily infect humans. For humans that do get infected, the mortality rate is about 60%. The math: a billion infections worldwide with a 60% mortality rate equals 600,000 deaths! (not to mention those who survive but are hospitalized with severe pulmonary disease). NOT a pleasant scenario! That is quite possibly some of the worst math I've seen in quite a while. 60% of 1 Billion is 600 Million. You're only off by about... 540 Million. Conoclast : 60% of 1 billion = 600,000,000, not 600,000. Tharguy(not any smarter). The difference between the two is: 599,400,000... Not 540,000,000. A billion infections worldwide with a 60% mortality rate equals 600 MILLION deaths! Always said that globalization is going to destroy this country (U.S.) completely at some point in time sooner than later! Drinking industrial bleach is a fantastically terrible idea. Nature will find the way to fight back against human pandemic. The more out of balance it is now, the more it is delayed, the more catastrophic the coming correction is going to be. I am not saying let's have it now: I am saying that will have devastating effect, and it's not about 'if' and it's rather about 'when' and 'how bad'. Humans do not want control, and do not accept any self-imposed limits: mostly because some liberals tell them that will violate their human rights and will be wrong. So, have it another way then, with two-thirds of humanity dying in a few months: and you can keep you human rights! Do you think Chinese one-child policy is cruel and anti-democratic: the Nature does not care about your politic games and will fall on you as a mountain! ...or maybe Nature will find a pandemic to fight back against humanity. What about a simple test to determine white cell count before travelling??? If a simple test on a colored strip could indicate an elevated white blood cell count it could save millions of lives, they could be handed out before boarding public transportation i.e.. aircraft!!! Nature has nothing to do with it, there is a group of scientists in the Netherlands that, for further "research ad vaccine" purposes, made the virus transferable between animals and humans. There is a court ruling and everything, the scientific community is basically calling these people crazy and praying that the mutated germ never gets out accidentally. This should be mentioned in articles like this, yet it never is. These people can't be stopped or held accountable if no one knows about it. Dr. Frieden is correct on all counts. CDC is one of the things we do really well. Let's play to our national/cultural strengths and provide support and build global partnerships to detect, track, and stop disease outbreaks wherever they happen. If there are difficulties in certain regions, then we can train and support the people doing good work on the ground, again through appropriate partnerships. Since nothing ever happens perfectly, our leaders will need to develope alternate plans to handle situations where old diseases remain despite the best efforts of the health community. Anyway, thanks for your efforts, Dr. Frieden. The way to prevent a pandemic (or at least to fight one) is to have the personnel and manufacturing capacity required at the time it starts. The only way to make this financially viable is for companies to be making money with those personnel and facilities before the pandemic actually occurs. This means they have to push people to get their flu shots, as it is the only way to maintain the system at a level that will be useful when a pandemic occurs. I just wish they'd tell us directly. From this reading it is for sure that somthing is comeing its not if it is when will it excape. If I am not mistaken (which i may be) that was regular influenza on its first outbreak. Many diseases do that during their first epidemic. i bet if you looked far back enough you would've seen a common cold epidemic that killed a large percent of the current population. Yes, we have had world pandemics before air travel. Still, I would be happy restricting travel to/from the places that are most likely to harbor a new highly contagious strain of flu. Chica, Asia, many countries that have extremely poor sanitation and rampant exposure to all types of poultry and birds that are consumed by humans. Easy. Shut down air travel. It is the easy air travel that is spreading disease around the globe. If Dark Winter taught us anything, it is that the US grid is unprepared for an outbreak. If this disease has the same spread rate as small pox does, then boy oh boy, fun times to be had indeed. best way to stop a pandemic? everyone stop going to war. I have always had the best respect for the CDC but, after seeing the LAME report from the CDC at the chemical river spill in West Virginia, I no longer respect the CDC! To think, my money supports this pseudo science! Disgraceful! Those people deserve a scientic answer. Who is more Equipt to give them a scientific answer than the CDC! That woman, who was there representing the CDC should be fired! Reblogged this on Partnership for Influenza Vaccine Introduction.